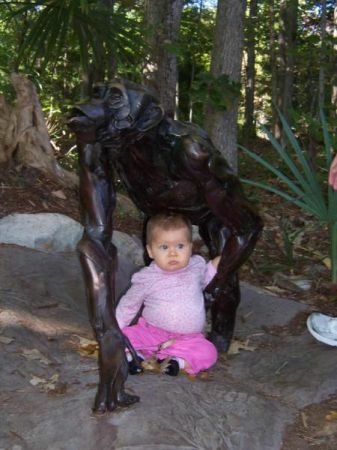 A Monkey Stole A Baby! It’s a chimpanzee and he stole my baby! Monkey just sounded better. We went to the NC Zoo yesterday and had a little fun posing Mara with the chimpanzee sculptures. It was just fun. Dad’s work had a picnic at the zoo that came along with free entrance passes. Mara didn’t necessarily get a lot out of it. It was hard to get her to notice the animals when there were so many interesting homo sapiens around to observe. Literally we were at the giraffe, zebra, and ostrich exhibit, and she couldn’t stop eyeing another mom and smiling at her. Oh well. We are sure to go back more and see it again when she gets a little older. It is a great place to take kids.